Roasted Jalapeno Avocado Dip: Football Foodie Kickoff Haverly’s Frijoles Borrachos (Drunken Beans): Football Foodie BEANS! First college games in the books (hooray triple overtime games that went to nearly 3 AM on the East Coast! ), last of the NFL preseason games finished (so sad for Steelers Sean Spence, what a great rookie prospect, now gone for the season), and a the long holiday weekend that marks the end of summer and the start of fall. The calendar may be ready to move towards the pro season, but the NFL certainly isn’t. ESPN’s Adam Schefter reported that the NFL and the National Football League Referee Association are meeting today for the first time in a month — a month! — for discussions on the current lockout. Of course the left-leaning cynic in me cannot help but chuckle at the idea of a lockout and contract negotiations going on over a Labor Day weekend, but sadly, here we are with replacement officials that are woefully unprepared for the first weekend of play. It’s not even winning or losing or a blown play that’s going to be the issue come next week, it’s the possibility of player injury by game mismanagement. Players play as close to the line of a penalty as they can now, what happens when the game is played full speed with all starters and battle-tested referees aren’t there to draw the line? When in a panic of inexperience, they don’t call something out of fear of being wrong and the line moves further back? Today, league commissioner Roger Goodell sent a letter to the fans about bounties and player safety without mentioning the replacement referees. Tell me again Rog how you’re truly worried about the health of the league that is about what is on the field, and not about what is in the bank account. There have only been a couple of desserts ever posted on the Football Foodie, Maker’s Mark Manhattan Mini Cupcakes and Chocolate-Peanut Butter Pretzel Cookies, not because we don’t like sweets (we do! ), but because we so very rarely make them for football. However, after a week of grilling recipes, we’d be remiss not to include one of our favorite, easiest, fastest desserts you can toss over the fire, pound cake brushed with liqueur and topped with a fruit-liqueur sauce. Even if you’re tailgating, this is an easy dessert you can do before the game, just make the strawberry sauce the night before and chill before heading out. Since dessert is generally at the end of the grilling day, your coals should have a nice medium-low heat to them which is perfect for the cake slices. If heating a grill or using a stove top grill, heat to medium low when ready to prepare the cake slices, after you’ve made the strawberry sauce. In medium sauce pan, bring the strawberries, sugar and Contreau to a low boil and then reduce heat and simmer for 3-5 minutes. Remove from heat. While the sauce is simmering, brush both sides of the pound cake slices with Cointreau. Once the sauce is done, grill the slices of pound cake for 2-5 minutes a side, depending on how hot your grill is running. The cake should take on a nice brown crust without charring. 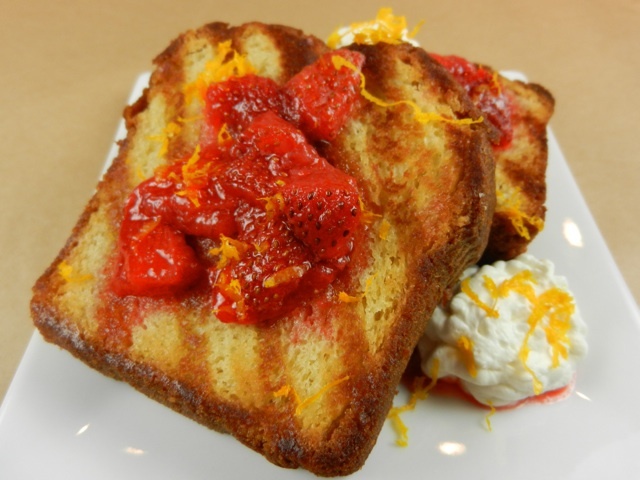 Spoon the strawberry sauce over the cake slices and top with whipped cream and orange zest. 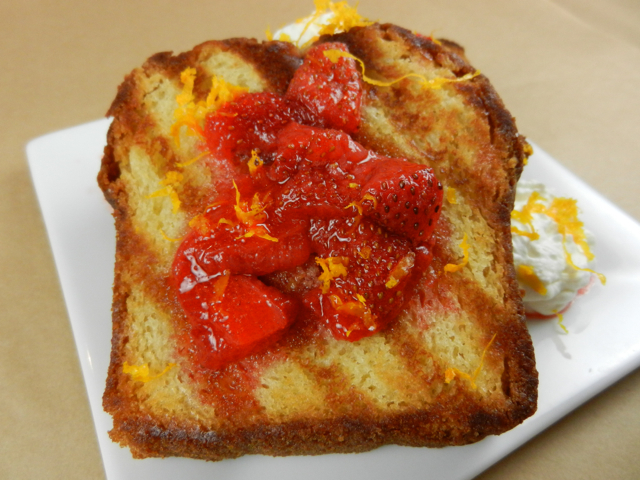 Sweet strawberries soak beautifully into the toasted bread, the liqueur adding just enough orange without being overly sweet. Great for when you’ve got some time before the night game and you don’t want something too heavy to weigh you down. Still time to join the Football Foodies annual CFB and NFL pick’em leagues. You might also like: Chips, Dips and Spreads and the Super Bowl Guacamole Extravaganza. Once the sauce is done, grill the slices of pound cake for 2-5 minutes a side over medium-low heat, depending on how hot your grill is running. The cake should take on a nice brown crust without charring. Strawberry sauce can be made ahead of time and stored in the refrigerator.